It is common knowledge that one of the world's greatest magicians gave himself the stage name of Houdini. He was born as Erik Weisz in Budapest on the 24th March 1874 to Rabbi Mayer and Cecilia Weisz and was one of seven children. He emigrated to the United States of America with his mother and four brothers, arriving on the 3rd July 1878. The family changed the spelling of their surname to the German "Weiss" and, in turn, Erik became "Ehrich". In turn that was shortened to "Ehrie" and anglicized to "Harry". According to his boyhood friend, Joseph F Rinn, in his book Sixty Years of Psychical Research, Weiss started his magic career some time in 1889. A couple of years later, in early 1891, he read The Memories of Robert-Houdin, the well known French magician. In part tribute to Robert-Houdin, and because he apparently believed that adding an "i" on the end of a name meant "like" in French, Harry Weiss decided to rename himself Harry Houdini and become a professional magician. The rest, as they say, is history. Unfortunately, the story doesn't end there. Houdini later found out that a number of the effects that Robert-Houdin claimed to have invented were not invented by him at all. This was obviously a crushing blow to Houdini who was now so well known under his chosen stage name that he could not change it. In a personal crusade he researched and wrote his book The Unmasking of Robert-Houdin which he finished on 20th July 1907 and which appeared in print the following year. Bizarrely, the printing in England claims copyright in 1906, 1907 and 1908. The book was dedicated to his father and contains many reproductions of photographs, playbills and illustrations from his own collection. He was very proud of his achievement and, in fairness, it must be said that in the days in which it was written the research and effort that went into its production must have been considerable. Indeed, he offered a prize of $250 if anybody could name "a book which has taken so much time, energy, travel and money, with such authentic data regarding real magical inventions." Despite all the work he had put in even he thought it likely that few people would read the work in its entirety. Indeed, in many copies there is his own handwritten note beseeching the reader to "Please read the introduction at least". Perhaps he thought that those who did so might skate over the rather vicious attacks contained in the rest of the text. It was not to be and the book was roundly castigated by the world of magic, especially in France, the home of Robert-Houdin. 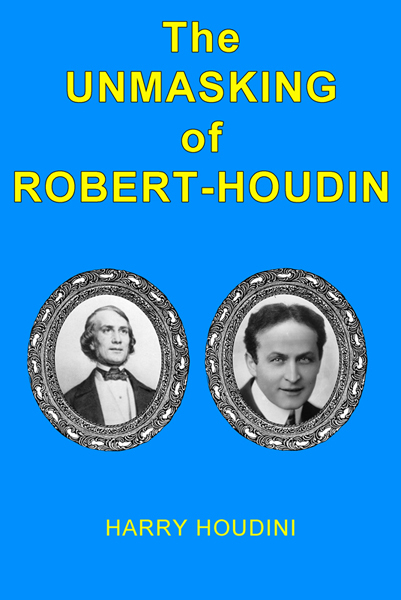 Indeed it has been suggested that Houdini wrote the book because he was shunned by the family of Robert-Houdin when he made his first tour of Europe. The truth will never be known but it is telling that Houdini later said "The only mistake I made was in calling my book Houdin Unmasked. It ought to have been the History of Magic." There is an element of truth in that statement as the book does contain a great deal of historical research into the illusions and effects of magic.